Yellow Jackets, wasps, boldface hornets, and other flying predators are good to keep some plant parasites on check. They eat aphids and larvae of insects that could damage plants. But if they are present in excess, they could cause some honey bee colony losses. A nest of yellow jackets could overrun a strong colony and kill it within a couple of days. Beekeepers should try to maintain a healthy level of flying predators around their bee yards. This will keep their garden plants healthy with the help of flying predators without allowing them to cause damage to honey bee colonies. 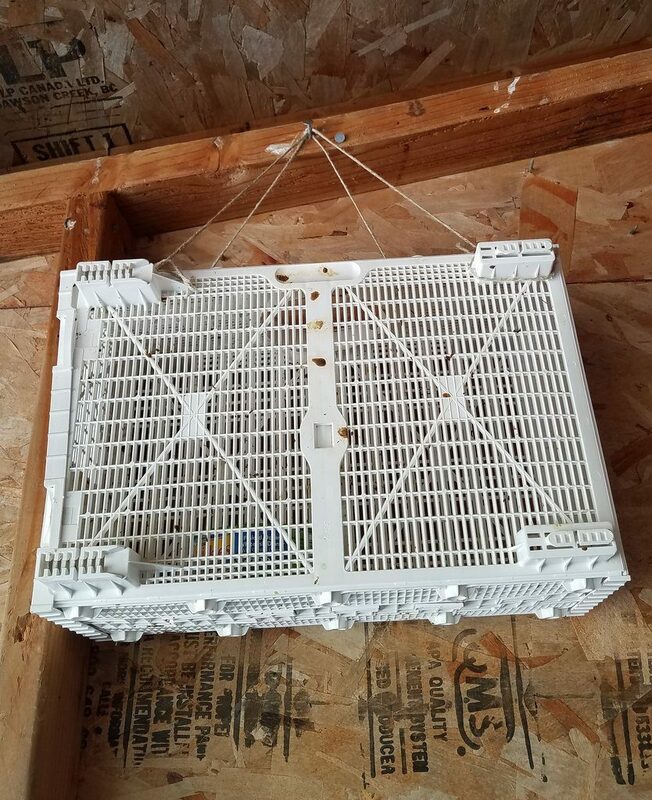 Set traps early in the spring, to catch queens and prevent nests from being formed (you are preventing one nest per early queen you catch). Control flying predator populations by resetting the traps through the season. We recommend the WHY trap, which is intended to trap Wasps, Hornets, and Yellow Jackets. If at any point you notice the flying predators keep trying to enter your hives, increase/refresh traps and restrict hive entrance areas by using entrance reducers or metal mesh/hardware cloth. By late summer or fall, the yellow jacket predatory pressure on your hives could increase because of the reduction of food available to them. When yellow jacket pressure becomes too high you will notice an increase of yellow jackets flying around hive entrances and trying to enter hives. When a hive is opened, yellow jackets will immediately fly straight into it and attack honey bees. If you kill a yellow jacket with your hive tool (we do it all the time), you may see two or three more yellow jackets coming to eat the dead one. In cases of high predatory pressure, the traps may become ineffective because they’re not interested in your bait (they’d rather eat honey bees than the bait you loaded in the traps) or just because there are so many yellow jackets that you cannot trap all the ones you should remove to keep your hives safe. In cases like this, we bring a bait/poison combination that kills all the nests in the area. Some universities have performed some research and experimentation to find the best combination of bait and poison load that would allow extermination of the nest itself. The smell and taste of the bait need to be more attractive to yellow jackets than the smell of honey bee brood. The poison strength and concentration need to be measured carefully. Too little poison and the nest keeps growing. Too much poison and the foragers die before bringing the toxic food back to the nest. An even higher amount of poison would act as a repellent and the yellow jackets would skip your bait. These flying predators are in the Hymenoptera Order, which is the same than ants. Many poisons/baits that are made to kill ant nests will also be effective to kill yellow jacket nests. For the bait, you can start with these options to begin with, but you could switch bait to whatever food attracts the yellow jackets in your area. The best bait would be the one that gets the job done at minimal cost. Poison concentration was calculated including the bait food. Fipronil can be found in different products to kill ants or even control parasites in dogs. 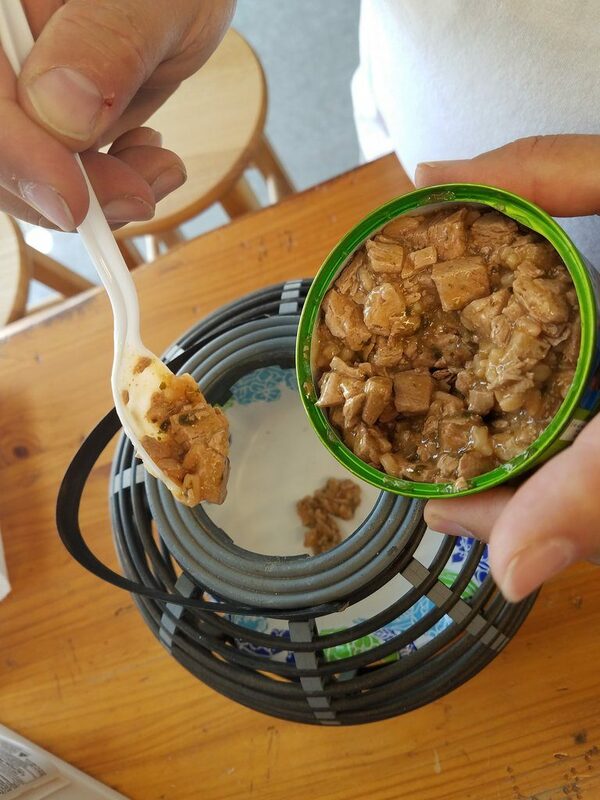 You will have to look at the concentration of the active ingredient on the product you purchase and calculate how much product to add to the bait, to have the right final concentration. 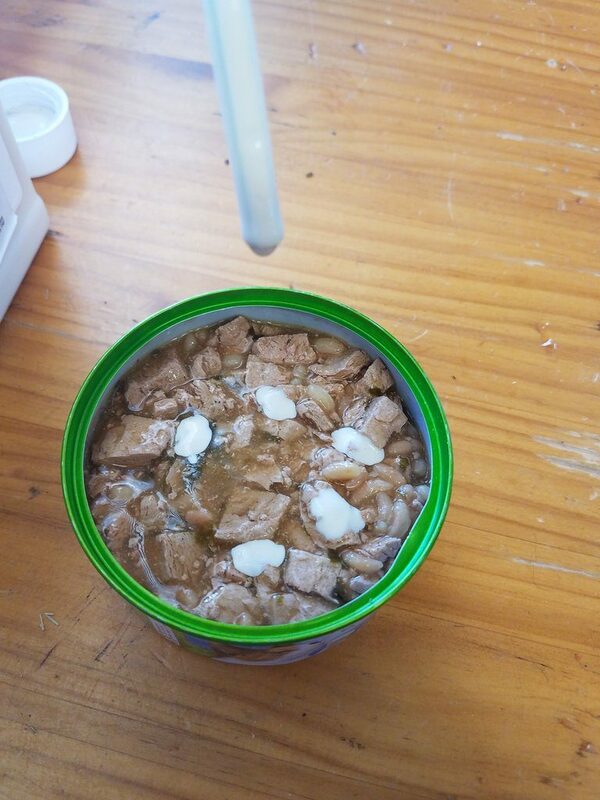 In the following picture, you can see the components we selected to prepare the bait. 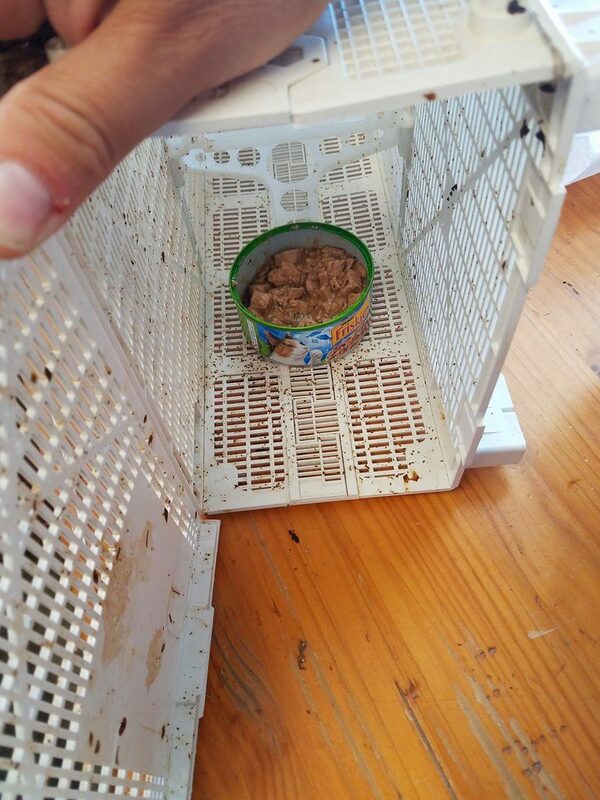 The can of cat food has a 1.65” radius (r) and 1.25” height (h), so the volume is: V=πr2h which is about 10.7 cubic inches or about 6 fl oz. For a concentration between 0.0025% to 0.025% of Fipronil we have to add from 0.00015 to 0.0015 fl oz of pure Fipronil. One drop of liquid is about 0.0017 fl oz, so a range of 1 to 10 drops of Fipronil solution can be used. 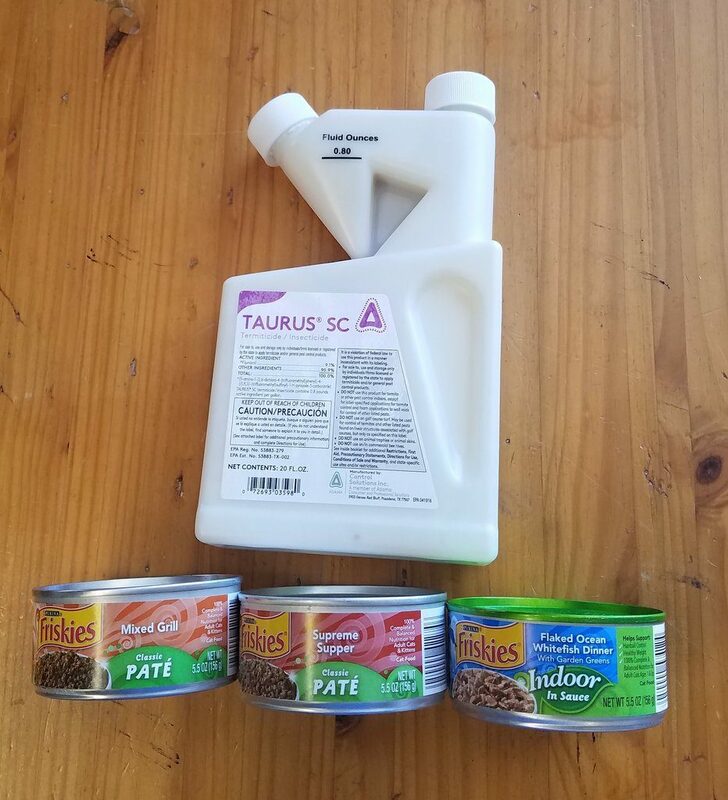 We use an average of 5 drops then mix it well into the whole can of cat food. You will need to set the bait with poison inside some kind of cage or protective equipment that can allow the yellow jackets to access the bait without allowing any other animals to reach it.